It's the middle of the week, which means it's time to look at the Media Create chart results for Japan. After a tough couple of weeks for Nintendo hardware things are a little more positive this time around - a new release is the key, of course. Shin Megami Tensei IV: Final arrived last week in Japan and has stormed to number one in the software charts; despite this it only managed just over half the launch sales of Shin Megami Tensei IV from back in May 2013. The Atlus RPG was one of only two new arrivals in the top 20, with most Nintendo-exclusive evergreen releases now in the bottom half of the list. Mario Tennis: Ultra Smash, Splatoon and Yo-kai Watch Busters can still be found in the top 10, though the first of those has only been out in Japan for a few weeks - the results are below with lifetime sales in brackets. It's been a week of minimal change in hardware, with the PS4 and Vita losing a little more of their Dragon Quest Builders-related momentum. That's allowed the New 3DS LL (XL) to reclaim second place, while combining all 3DS models together brings the portable family just a handful of sales short of Sony's home console. Wii U sales are still rather grim - the results are below with last week's figures in brackets. That's it for another week in the Japanese retail scene, with some positive news for Atlus and consistent 3DS sales giving Nintendo some comfort. Awesome, this one needs an international release ASAP. Here's hoping this will be just as good, if not better than the excellent SMT4. Also wondering if it will get a physical release here in Europe, or if it will be digital. Mind if I barge in and ask for a boxed European version, Atlus? If there's any game that'll get me to pay their stupid upcharge, it's this one. I don't even care. Just announce the NA release date already. My 3DS needs this game in its cartridge slot. Those pathetic Wii U sales though.....if this doesn't confirm NX this year I don't know what would. As for SMT IV Final I look forward to hearing a release date over here soon. Maybe I should beat the first one when that dates announced. Considering how often Atlus puts there games on sale, i'm tempted to just wait for one for this game. How about the fact that Nintendo always almost always announce a product 18 months before launch? Time will tell just how long SEGA will put up with the lack of profit that Atlus makes. I'm willing to bet that Atlus will be sold out to someone who wants to make use of them. Ghee SEGA, you really can't seem to make use of the companies that you legitimately own. @Sanicranfast Well, I think we can be pretty sure that won't happen this time around. I mean, maybe they intend to spend another ~18 month being outsold 7:1 by their main competitor on their hometurf ... or maybe not. Frankly though, I'd say that is not even the worst of it. The worst of it, is that Nintendo is on the verge of becoming irrelevant in the game space. I mean, you don't have to like games such as Destiny and Fifta 16, to realize that it's really bad, if those are the chart toppers out there, and at the same time all games, that are no longer coming to the WiiU, not now, not in the future. Nintendo needs to be part of the conversation again, and not just within circles of diehard fans. The WiiU can't achieve that, and that is the real issue. There is no way for Nintendo to turn the systems fortune around at this point. Even if they throw the best Zelda ever at the system exclusively, that effect will be only temporarly, before the conversation moves on to something once more not released on the system - not to mention, that it would be pure and utter madness to wast a ressource as valueable as a complete Zelda game on the WiiU at this point. Look how closely the Wii U,3DS and 3DS LL match last weeks hardware sales.Wii U down 6,3DS up 12 and 3DS LL down 7.Between 3 consoles only a difference of -1 sales.Mad that! Really hope this comes to the west, and soon! As far as I am concerned, Shin Megami Tensei IV is the best game on 3ds, can't wait to play the sequel! @Spoony_Tech I look at it this way. If it's good enough for the Japanese people taking it to #1 it's good enough for me. Shin Megami Tensei 4 is my favorite 3ds game of all time so far. This will be a day 1 purchase. Got Resident Evil 4 in the mail yesterday. Spoony.....thanks so much for that recommendation. The game is awesome. I've been playing about 3 hours so far and WOW! I wasn't expecting this good. Perhaps I should start looking into these type of games. Thanks again my friend. If they would do a 3ds version I would buy that. I picked up Dimentium from Renegade Kid which is also very good. It's 3D effects are kind of eye popping. I hope it does well enough to keep Renegade Kid making games for us in the Eshop. I'm so worried we might lose them. @Spoony_Tech they are still having stock shortages aren't they?! @sandman89 They must be, there's no way the Wii U could sell this low in Japan for 2 weeks straight. Yeah, PS4 will have outsold the Wii U in Japan by Christmas. @Spoony_Tech Sega/ATLUS improved their release schedule lately. Over the past two years, you can expect the localization of a title to be released in America 3-9 months behind its Japanese release. @Socar Funny that you say that considering that SEGA admitted they had quite a lot to learn from ATLUS, particularly in the field of quality of games. @KingofSaiyans That's an interesting take, but on the one hand, I would argue that the best chance for anything like that, probably rests with their new mobile strategy, on the other hand I believe it's really not only about profits. Nintendo is not exactly in dire financial straits yet, not after the Wii/DS era, so I think for them, the most important question is one of awarness: How can they keep people engaged and interested? Wow can they stay relevant in a gaming landscape that is rapidly evolving these days? If they can manage that without the NX or a 3DS successor, then sure, do what you have to do, to keep your bottom line sustainable, and take the time you really need to make your next project as 'perfect' as humanly possibly, but I'm frankly not sure they can manage without the awareness a new launch generates. I think that is their most basic while also most prominent conundrum right now. Luckily for us, there is an upside to all of this, and that is Nintendo reaching for anything that creates some substantial positive buzz for them. I'm highly spectical that we would have seen this kind of very swift localization treatment for niche games like 'X' and even FE:Fates right now, without Nintendo being desperate for being seen as relevant, active and just kind of ... there, even for so-called 'core gamers'. I think, under different circumstances, like last gen, they would have dragged their feet without end, and in fact they did, just think about Xenoblade Chronicles and The Last Story .... they made us publicly beg for it for months and months on end. A similar situation today is borderline unimagineable ... company that can't reel in 3rd-parties, and can't deliver on first-party goods, or generally localization deals for their system, while delaying major blockbusters like Zelda and to a lesser degree Zelda all the time? That as bad a reputation as you can create for yourself as a platform holder. @TheWPCTraveler The first SMT IV was like 6 months if I recall correctly. Atlus really has been doing an excellent job localizing quickly. 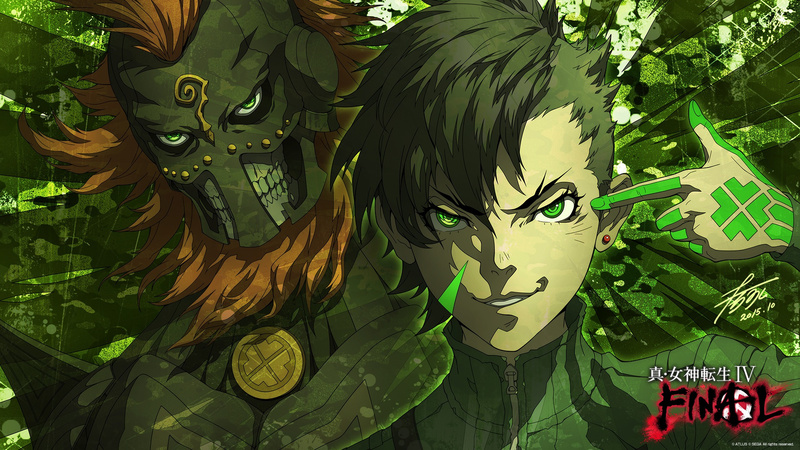 Shin Megami Tensei IV: Final is another game I have been eyeballing. I want this one. I wonder how long it will take for it to come out.